Would you like to dine on Pandas, or Whales? Honestbee are a concierge grocery delivery service in Singapore, according to their description on Facebook. We’re gathering they help people shop for and deliver groceries. They’re also casual jokers, but they’re turning some heads with their April Fools joke. Or at least we’re hoping this is a lead up to April fools day. Having seen through their paper thin joke/viral marketing campaign. 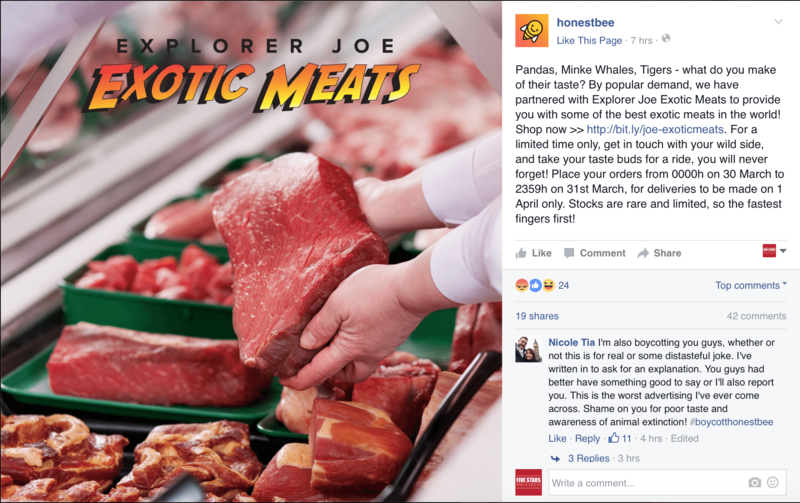 There’s even a website for Explorer Joe Exotic Meats, and they’re bringing it back due to popular demand. Really guys? You’re going to use the plight of endangered animals to get some clicks. The joke might be on them it seems, as the comment in the image suggests.